Government authorities and aid agencies in Tunisia say they are prepared for a sudden additional flood of refugees from Libya despite growing public hostility to the influx ahead of presidential elections. A crisis plan drafted by a working group of Tunisian regional and central authorities, local civil society organizations, UN agencies and international NGOs aims to ensure space for refugees in the event of the security situation deteriorating rapidly. In Medenine Governorate, which borders Libya, the local authority has reserved 14,500 spots for potential refugees in indoor halls, youth hostels, and hotels. Similar measures are to be taken in Tatooine Governorate, which could also be affected. Under the plan, money has also been put aside for food needs, according to Salah Rouissi, vice-governor of Medenine. He declined to say exactly how much. As Libyans can enter Tunisia without visas and many have the financial means to leave border areas for cities across the country, the UN Refugee Agency (UNHCR) does not have figures on the numbers inside the country. One politician recently estimated the figure at 1.9 million - though this includes hundreds of thousands who have been based in the country since before the 2011 war that led to the overthrow of former President Muammar Gaddafi. "It is difficult to say exactly how many [there are]," Muftah Etwilb, North Africa representative of the International Federation of Red Cross and Red Crescent Societies (IFRC), said, explaining that most Libyans prefer to remain unregistered. Yet the authorities appear better prepared to support the refugees than during the previous crisis. In 2011, when fighting erupted between Gaddafi'sgovernment troops and rebels, nearly 700,000 Libyans and other nationals fled to Tunisia and Egypt. The influx, coming so soon after Tunisia's own revolution, overwhelmed the country in certain areas, having an additional negative effect on the economy. And while aid workers do not expect the same scenario again, they insist that they are now better able to cope. "This time we are prepared to respond, learning from 2011," Etwilb said. "We started early in January, when the humanitarian community here started an appeal." He added that currently the situation on the borders was relatively calm, but that upticks in violence often led to thousands of people crossing in one day. Another element of the plan is ensuring hospitals are well-equipped for emergencies, according to Monji Slim, head of the regional Tunisian Red Crescent office in Medenine. Etwilb added that a mobile clinic was due to begin operations in the coming days. "It will serve the displaced and the refugees but also the local population," he said. In addition, UNHCR has set-up pre-registration container offices at the Ras Jedir and Dehiba border crossings. The offices are designed for asylum seekers entering Tunisia in the case of an influx, UNHCR Tunisia's Julia Gouyou Beauchamps told IRIN. While government bodies and aid organizations are preparing, increasingly Tunisian politicians have been more vocally critical of the refugee influx. In July the then foreign minister said Tunisia could not support any more refugees and threatened to close the border. The refugees are also increasingly accused of having links to Islamist groups alleged to be planning attacks inside Tunisia. Last month the border was briefly closed on the grounds of security as the country held successful parliamentary elections, and it is likely that similar closures will take place for the two rounds of presidential elections later this year. The refugees have also been banned from engaging in any form of unplanned public political activity. For the Libyans, this newfound hostility has compounded their sense of loss. "Other people from my hometown escaped to Egypt, or had dual nationality so they travelled to other countries," said one refugee - a widow - who did not want to be identified. "But all my relatives are back home [in Libya]. I had no one here in Tunis... And I've been struggling to survive and provide a good life for my son." "It's hard to feel like you're worth nothing, after being so active and achieving so much in the past," she said in tears. The massive flow of people has put a strain on the main Ras Jedir border crossing, already unstable on the Libyan side due to shifting power politics. IFRC's Etwilb admitted that it was not always clear who was in control as various different groups vie for power, among them the Zintan militia from the area near the border. Medenine Governorate's Rouissi said they were confident the border would remain calm. "Despite previous problems at the Ras Jedir border crossing right after the conflict in Libya [flared] in April, everything is currently under control," he said. 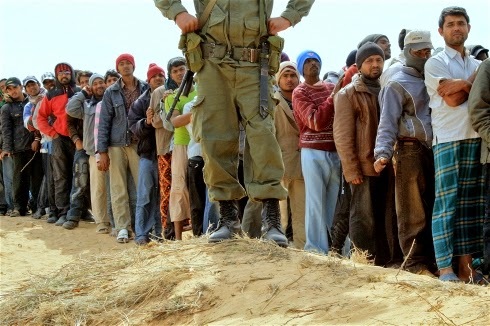 Many of those entering Tunisia are not Libyan refugees, but rather migrants who had been living and working there, including Indians, Pakistanis, Moroccans, Algerians, sub-Saharan Africans, and most of all, Egyptians. "We witnessed an intense period when there were between 700 and 1,000 Egyptians entering Tunisia from Libya a day," Rouissi said. "We made sure everyone ate, and had their needs fulfilled until they reached the airport to go back to Egypt," he added. Through coordination with their Egyptian counterparts, Tunisian authorities were able to provide an air-bridge via Djerba-Zarzis and Gabes airports. Together with the International Organization for Migration, the Tunisian authorities have also been coordinating with embassies to arrange the return of other third-country nationals to their home countries.